Actor Bill Paxton, who was best known for his role in the sci-fi classic Aliens, has died at the age of 61, US media report. Paxton had reportedly suffered from complications following surgery. The Texan actor's biggest hits included The Terminator, Apollo 13, True Lies, Titanic, and 1996's Twister - in which he starred opposite Helen Hunt. He is survived by his wife of 30 years, Louise Newbury, and their two children. Paxton won an Emmy for his performance in the TV mini-series Hatfields and McCoys, alongside Kevin Costner. He also earned three Best Actor Golden Globe nominations for his starring role in the HBO drama Big Love, where he played a suburban polygamist juggling three wives and families. Fellow Hollywood stars were quick to pay tribute to Paxton as news of his death spread - among them West Wing actor Rob Lowe. He wrote on Twitter: "Devastated by the sudden loss of my close friend and one of the finest actors in the business, Bill Paxton. Renaissance man, raconteur and uniquely American national treasure. His filmography speaks for itself. His friendship was a blessing. My love to Bunny, James and Lydia. Cary Elwes, his co-star in Twister, shared a picture of the pair together and praised his "talent, enthusiasm and energy". Jamie Lee Curtis, who co-starred with Paxton in True Lies in 1994, tweeted her sadness, writing: "Nooooo. Bill Paxton is gone. Such a funny, talented, loving human." Arnold Schwarzenegger, who acted alongside him in Terminator and True Lies, said: "Bill Paxton could play any role, but he was best at being Bill - a great human being with a huge heart. My thoughts are with his family." 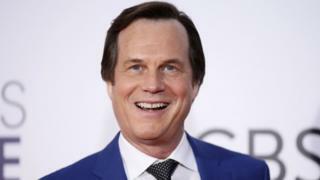 Tom Hanks, who appears with Paxton in the forthcoming film The Circle, said: "Bill Paxton was, simply, a wonderful man. A wonderful man." Patricia Arquette said: "Bill Paxton such a wonderful actor. He always brought so much complexity and humor to his characters. RIP"
Peter Fonda tweeted condolences "for the loss of a wonderful, warm, father and husband" and said: "It was always a pleasure to be in his company." Producer Jerry Bruckheimer said: "I am devastated at the passing of my friend Bill Paxton. He was a tremendously talented actor and a wonderful man." Paxton's family said in a statement: "A loving husband and father, Bill began his career in Hollywood working on films in the art department and went on to have an illustrious career spanning four decades as a beloved and prolific actor and filmmaker. "Bill's passion for the arts was felt by all who knew him, and his warmth and tireless energy were undeniable. We ask to please respect the family's wish for privacy as they mourn the loss of their adored husband and father."